Suraj Patel, Civil and Environmental Engineering B.S. 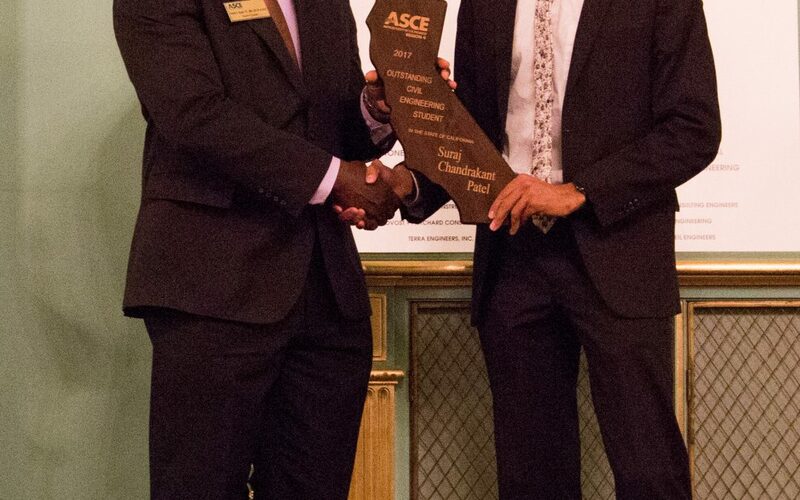 2017, selected as the ASCE Region 9 Outstanding Civil Engineering student. Patel served as the UCLA ASCE President 2016-2017. ASCE Region 9 Individual Awards recognize individuals for outstanding achievements or leadership in civil engineering, or who through their work, support and advance the profession. Each year, ASCE Region 9 presents Individual Awards at the Annual ASCE Region 9 California Infrastructure Symposium and Awards Dinner. These Awards are selected from nominations made by the Sections, Branches, Younger Member Forum, Life Member Forum, Technical Groups, Committees, and individual members.